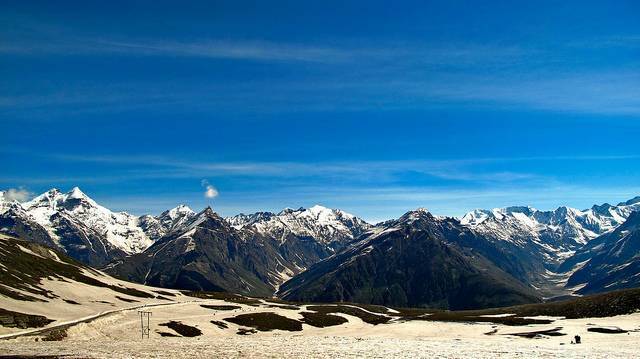 Manali is an evergreen hill station nestled snugly among the hills in Kullu Valley, Himachal Pradesh. This gorgeous town is a must visit for any and everybody. Family men to seasoned trekkers, this is a place for all. Situated by the lovely tanzanite river of the mountains, Beas, this town seems straight out of a fabulous collection of paintings created by a nature-loving artist of Victorian Europe perhaps! A number of temples and monasteries justify the sobriquet “Valley of the Gods”. This place is ancient and new at the same time. It was an eminent stopover for traders of the silk-route but its advent as a major Indian tourist destination can be traced back to the 80s. Legend has it that the ancient Indian lawgiver Manu recreated life in the hamlets of Manali when it had been decimated by a flood, thus the name Manali originated from “Manu-Allaya” (Abode of Manu). Lakhs of tourists are drawn to the hill station every year, mostly during moderately cool summers. Some are drawn to the hippie villages on the outskirts, some to the fresh mountain air and ethereal milieu while some adventurists prefer it to other paragliding, skiing, rafting and trekking spots in the country. This Himalayan hill-station located at an altitude of 2050 m is a place where you create pictures for your mind-album. This is the kind of place you create memories in. Do you want to hike? Do you want to visit temples? Do you want to wade about in hot springs? Do you want to click selfies against exotic waterfalls...rock climbing, paragliding, skiing, snow-scootering, river-rafting….life’s days might run out but not things to do in Manali! Be it Mahabharata’s Hidimba, Kullu’s presiding-goddess Ma Sharvari or the hero from Hindu mythology Manu-Maharishi, the temples bespeak beauty and immortality. The Hadimba temple here was erected in 1553 in devotion of Hadimba, Bhima’s wife from Mahabharat. The activities carried out in the temple include gruesome animal sacrifices and dances in the 3-day Dhungri Mela in May. Amidst the mountains, surrounded by perpetual winter forestry, these places are like a dream. Are you in a mind to indulge your body and let nature pamper you to the extent of oblivion? Then you are waiting to visit the Kalath and Vashist hot springs, or do you have something like a hectic but fulfilling hike to a waterfall and then let the cascading waters drain out your fatigue. There are the magnificent Jogini, Rahala, Rozy and Zana waterfalls waiting for your visit. Adventure lovers can indulge in rafting, hiking, trekking etc. Don’t miss out on the trek routes of Deo Tibba Base Camp, Hampta Pass or Friendship Peak? Please make sure that you don’t? The snow point, Rohtang Pass is where you can ski and have that elaborate snow-fight you want to capture in your photo-album. Tibetan Monasteries are also important places to visit in Manali, Himachal Pradesh. Manali Gompa to the Tibetian-styled temples of New Manali, this place is so replenished with wonders for travelers that it is simply impossible to cover everything in one go. You need to go there and stay there for a considerable period of time to cover all of Manali but beware, even then, some things might be left out. Old Manali is a popular backpacker destination. Apart from these, Museum of Himachal Culture and Folk Art and Buddhist Monasteries are promising visits. For culinary enthusiasts, a few upscale restaurants like La Plage and restro-bars like Lazy Dog Lounge might be good options to explore. Khyber and Mayur are felicities for those who prefer Indian cuisines. In Manali one can look forward to buy – shawls, jackets, dress materials, dry fruits and saffron.